Doctors in Haiti have difficult decisions to make, such as whether to send Maudeline Michel to the United States for surgery to fix her hand. Every rescue from the rubble in Haiti is cause for celebration, but the staggering number of injured is forcing doctors on the ground to make agonizing decisions about who among the critically injured will be lucky enough to go to the United States for treatment. 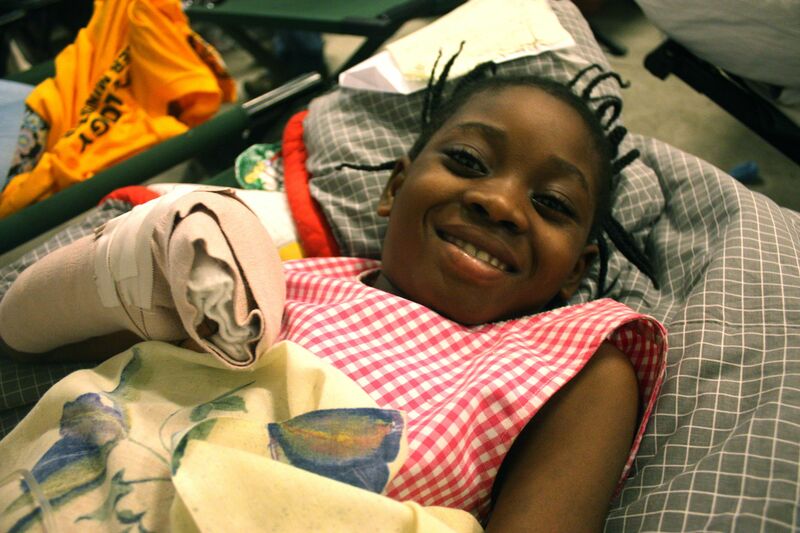 The unlucky ones – the critically injured who stay in Haiti – will most likely die. One night last week at a field hospital run by the University of Miami, Dr. Karen Schneider came to me with tears in her eyes about one such decision, where a boy’s life hung in the balance. The boy’s mother, who had lost her three other children in the earthquake, was at the boy’s bedside, begging Schneider to help her only son. There were three seats on this University of Miami plane, and Schneider was pushing for her patient to be in one of them. But this boy’s situation was so precarious, the doctors in charge didn’t want to put him on the flight, preferring to hold the precious spots for patients with a better chance of living through the trip and making a full recovery. The boy’s name was Charles. He was 12, and both his legs had been crushed and were infected. He’d just spiked a fever, indicating that the fever was spreading throughout his system, which could very quickly lead to septic shock and death. A separate disease loomed on top of the infection. When muscles are crushed, they release proteins into the bloodstream and the kidneys can’t handle the proteins and shut down. The disease is called rhabdomyolisis, and it causes a swift death. Schneider didn’t know which would kill this boy first, the infection or the rhabdomyolysis. All she knew was he needed both legs amputated and fast. The tiny operating room in the University of Miami hospital couldn’t handle a double amputation. The loss of blood would be substantial, and they had no blood to give him. “Did you try to get him to the Israeli field hospital?” I asked her. A much better-equipped hospital, I knew they could do more complicated surgeries there. “We brought him there and they sent him right back,” she answered. They, too, couldn’t handle a double amputation. The only option she saw was to get him on the University of Miami plane back to Florida. “He was on the list to be on that plane, but then they took him off and replaced him with someone who has a better chance of making it,” Schneider said. As frustrated as she was, Schneider, a veteran of dozens of medical missions to poor countries around the world, understood the need to make tough decisions. Not only were the plane seats precious, but her patient was so sick he’d need weeks of very expensive intensive care once he arrived at the U. S. hospital. That money to save one life could instead be used to save many, many others. Making these decisions is like playing God, I said. “Yes, it’s like playing God,” agreed Schneider, who as a member of the Sisters of Mercy, a Catholic religious order (yes, she's both a nun and a medical doctor), knows a little something about divine decision making. As Schneider and I pondered what her next step should be to save this boy, I remembered a conversation I’d had with Dr. Veronica Diaz, a surgeon at the University of Miami hospital. Maudline Michel, age 11, had come into the University of Miami field hospital with a “degloving” injury to her hand, which is just what it sounds like: The skin is completely removed from the hand. Diaz, who’s doing a fellowship in hand surgery at at Allegheny General Hospital in Pittsburgh, cleaned out the wound and dressed it, but unless she got help quickly from a modern hospital, Maudline would lose use of the hand completely. Getting Maudline on one of the University of Miami planes, at least last week when I talked to her, was out of the question, as her life was not at risk. So she remained in Haiti and will most likely lose use of her hand. Schneider’s patient, however, had the opposite problem, which was that her patient was too sick to get one of the coveted spots on the airplane. “Have you talked to Barth Green?” I asked Schneider. Green is the University of Miami doctor who’s ultimately in charge of the hospital. I’d seen Green move mountains, the kind of guy who can stop a tsunami with a phone call. Schneider immediately went to find him. A few hours later, Schneider found me again, but this time she had a big smile on her face. “Green got the boy on the plane,” she told me. Reflecting this weekend, Schneider said, "I have no idea how" Charles got out of Haiti. "All I know is he got on the plane." Are you for or against the federal stimulus plan? Almost three out of four Americans say at least half of the federal stimulus money has been wasted, according to a CNN/Opinion Research poll. 63% say they believe projects in the plan were included purely for political reasons. Are you for or against the federal stimulus plan? Why? Leave your comments below. We may use some of them in the CNN NewsRoom beginning 11am ET/8am PT. Join TJ Holmes and Betty Nguyen weekend mornings in the CNN Newsroom, beginning 6am ET.